Even though I haven't been writing this post for a while, many of you have still been reading. I really wanted to give my perspective on gift buying before Black Friday. This way, those family gifts and tough-to-buy-for situations have some good options. The games on last year's guide are still available, so use that guide for additional ideas. Just like last year, I am writing this with a focus for those who are casually interested in the boardgaming hobby. These games will be available through local game stores or online, and man of them should also be available through some larger, mass-market outlet. Target and Barnes and Nobles are now devoting more shelf space to the types of games that I have written about. Links to my reviews of these games are embedded in the text. Now back to the show! This person has fond memories of playing Risk and Monopoly as a kid, and probably played these games at least some as a teenager. Last year, I recommended the revised version of Risk as a good game, and this is still a great choice. This year I will recommend Risk Legacy. This game has a truly revolutionary game concept in it. As the game is played, there are actions that can be taken that permanently change the rules of the game or the game board. Some of these changes remove cards from the game permanently. By permanently, I mean tear the card in two and throw it in the trash. In other words, each game will be played under slightly different conditions. My first reaction to this was, "What! Why would I deliberately damage my game?!" I have come to think of this as an experiential thing, and I would love to play! Furthermore, playing through all of the actions will take 15 game sessions, so there is a lot of experience to be had along the way. 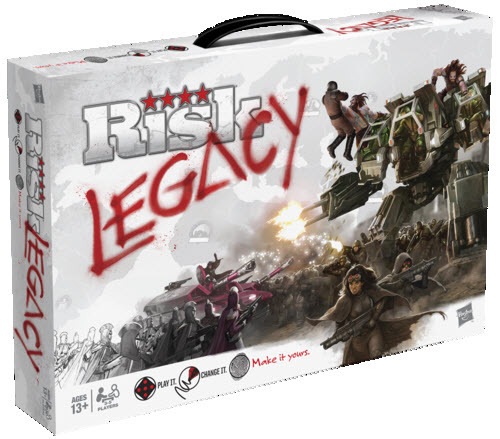 A copy of Risk Legacy will probably need to be purchased online or at a local game store. I am going to repeat my recommendations from last year. Buy Qwirkle or Bananagrams. These are two great games, and still some of the more economical choices, too. If you bought someone on of these games last year, buy them the other this year. All of the mass-market outlets will have Bananagrams, and many will have Qwirkle (Target has carried it for several years now). I am going to go out on a limb here and say Bohnanza. I haven't actually played this, and it probably will need a local Barnes and Nobles or a trip online. However, it has a great reputation within the gaming community and with friends of ours. As a bonus, it plays well with 3-7 players, so it works well for gatherings. Don't let the age range on the box scare you at 13+, I know younger kids love "the bean game". The game sounds silly, but that's part of the charm. This starts to get tricky, because there is the chance that you will give a gift they already have. However, Deadwood is a pretty safe bet, since it was published just last year. This is one of the less expensive choices on the list. It's American West theme will appeal to many. 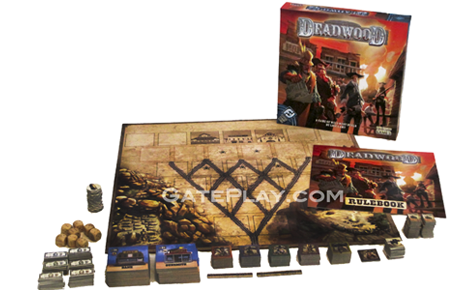 Deadwood is published by Fantasy Flight Games, who puts a lot of care into a games presentation. Deadwood has recently become available at Target. By far and away the best game to geek-out on this year is the Star Wars: X-Wing Miniatures Game. This is a dogfight game pitting X-wings and TIE fighters. And Y-wings. And Interceptors. And the Millennium Falcon. Not all of this comes in the box; some are coming out in expansions. The box includes three fighters and everything else you need to play the game. I have played the games predecessor, Wings of Glory, which is set in WWI. As a geek, this game has me juiced, and my son is thinking he needs to own it. Star Wars: X-Wing Miniatures Game is available at Target. Sorting through the drivel is the biggest problem. 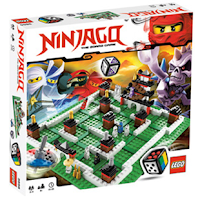 I will go with the LEGO Ninjago Board Game. It may not be the very best game, but hey, it's LEGO. How far wrong can you go? 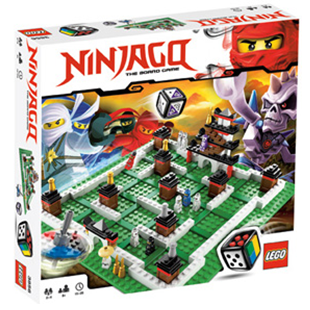 LEGO Ninjago Board Game has become generally available in the mass-market stores. Last year I had Qwirkle and Forbidden Island here on the list. These are still great choices. This year I will add King of Tokyo. In this game, you play Big Monsters (think Godzilla) attacking the city of Tokyo, and each other. Games are short and can be filled with lots of campy humor, since the monsters have such silly names as Cyberbunny and MechaDragon. Sound effects are part of the fun. Kids can easily play this, though the energy level might ramp up as they get into the them! King of Tokyo is definitely going to be the toughest game to find on this list. It might be between print runs as the holidays arive. However, since the two choices from last year are solid options, I don't feel too badly about this one. 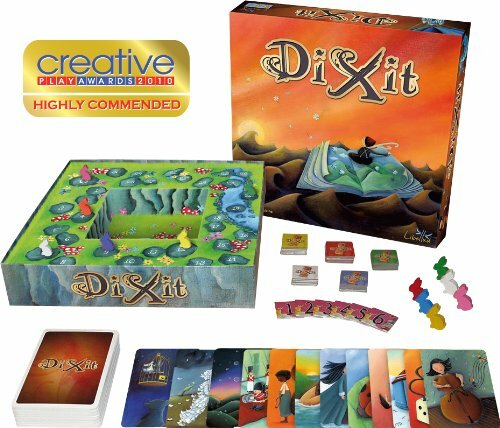 The Spiel des Jahres winner for 2010 was Dixit. Think Apples to Apples with pictures. One player makes up a sentence which tells a very brief story from a picture, and everyone else picks a picture from their hand to match the story. The storyteller chooses the best match, and points are scored. Sound a little similar. What makes this a great choice is not only the proven style of gameplay, but also the excellent artwork. Dixit can be found at many mass market outlets. Many of the games here work well for two. For this, I am going to go with my recommendation for last year: Hive. This game is an abstract strategy game the is incredibly popular in our Scout troop, and it is easy to learn. There is now a smaller edition called Pocket Hive. So, you can even recycle this idea if it was a big hit last year. I have found Hive at Barnes in Noble. I will be glad to answer any questions!